This will be the first time since NASCAR’s Championship Week Celebration was in Vegas that I will not be attending. There is a personal reason I am not attending, but even without that I had not planned to attend this year but instead going to Disneyland this year (postponed Disneyland too for that personal reason). Mostly because it seems that After The Lap which was always my favorite part of the weekend- has turned more into a concert and less of a driver Q&A. Based on what I see from the schedule of events there aren’t many events for Champions week where all the drivers are together- which kind of bums me out. This year, After The Lap, starts much later, is located in the middle of the Las Vegas Strip and according to everything is scheduled to run a full three hours. I have also heard that the fees on tickets for the event now cost more then the tickets to the event- so there is that. This part disappoints me greatly. Don’t let me disuade you from going. After The Lap is held at The Cosmo on Wednesday Nov 29th at 8:00 PM: Tickets for After The Lap. There are improvements to the week long festivities especially over recent years when it was quite obvious to this fan that SPRINT’s support of the series was waning. Last year’s event was minimum and paltry. One of my favorite new events that is part of the champion festivities is that the championship drivers are having scheduled autograph sessions which I think is a great idea. However- you can only attend one of the autograph sessions (although if you a stealthy pair of fans you could have one fan sign up for two tickets to one session and the other friend sign up for another session) so you are limited to the four drivers in the session you sign up for. A majority of these sessions have already reached their cap for this year unfortunately but there are a few sessions with tickets left so I wouldn’t wait much longer to sign up for one- at Driver Autograph Sessions (best I can tell these are free but you need tickets). Dale Jr Fans will be especially treated to an event just to celebrate him (I assume that he won Most Popular Driver again). There appear to be tickets left for this event but be warned- these tickets appear to range in price from $188 to over $400 a ticket (YOWZER) tickets to appear to come with a drink voucher (Still YOWZER). This will be held at the Cosmo on Tuesday Nov 28th. Dale Jr Appreci88tion Event. 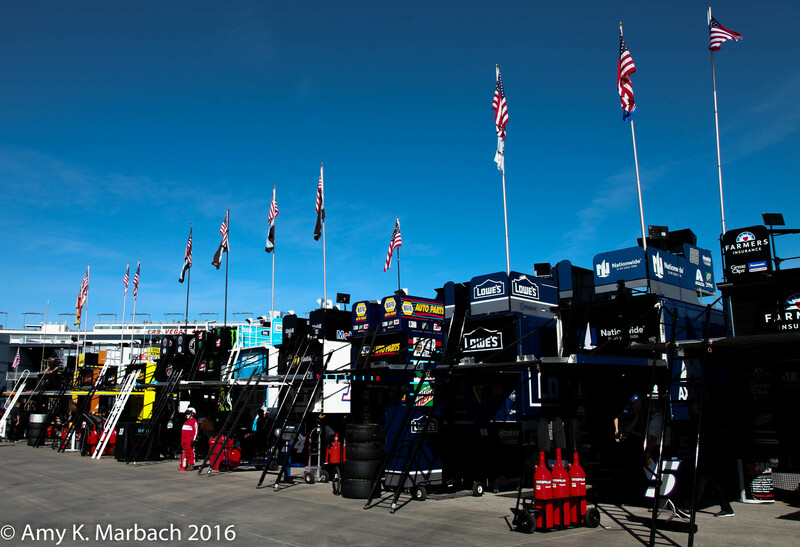 (This is a race diary post- meaning that I was actually at the track running around. It will be very first person and chucked full of pictures. If you are looking for something more like my usual race report you can read the official team report for Team 14 here. – Amy). 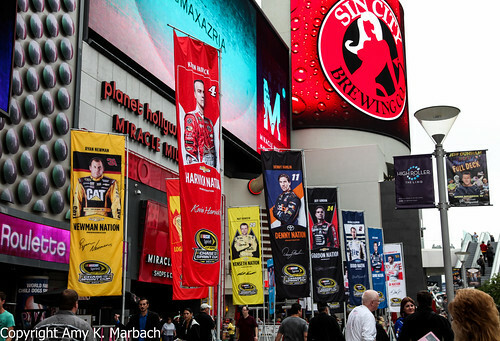 I have yet to miss a NASCAR Champions Week in Las Vegas. Luckily for me Misty lives nearby so I am able to attend some of the fun! This year we actually splurged and got a room at the Palms since that is where After The Lap was to be held again. It was a nice room and casino (not that I had much time to gamble). Friday is the Amy-To-Vegas 500 and Monday is the Home-Again-500. Join me on twitter (@badgroove) for updates. Misty and I have been attending NASCAR’s Sprint Cup Champion’s Week celebrations since they started having them in Vegas. I can NOT encourage you to go enough if you can at all swing it! 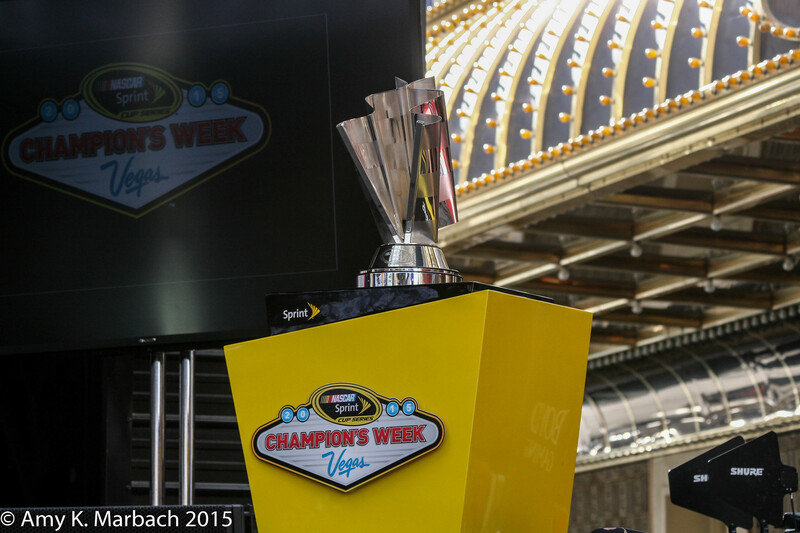 Attend Champion’s Week! Seriously. It’s one of my favorite events of the year! If you have been reading BadGroove for awhile you know that I go to the NASCAR race in VEGAS every year. It was the track I took in my first NASCAR race at (the same holds true for Misty because I drug her to that first NASCAR race- and a fan was born). Of course it helps that Misty lives in nearby Henderson and lets me stay with her while we are having our racecation fun. Anyway, fair warning- I took a LOT of pictures while in Vegas. Most at the track were taken on my “real” camera (I used a Canon 20D with a 300mm lens) but some on my iPhone as well. If you followed along on twitter or happen to be my Facebook friend- you were subjected to lots of my iphone pictures over the course of my trip. So don’t be surprised but I am not going to just post pictures here- but I will more than likely direct you to Flickr sets (yes multiple ones) so you can see all the race time FUN we had in Vegas. So I drove into Vegas on Wednesday- it takes me a good 8 hours to get there…I got a tour of Misty’s rockin’ new house (it’s AWESOME- her room? Is HUGE) out by Lake Las Vegas in Henderson. On Thursday Misty had to work a part day…so I hung out with her at her job- which was kind of cool- to see her in action at her job. Then on a lark we decided to drive out to the Speedway to pick up our credentials for Friday-Sunday. If we knew about the Thursday test in Vegas we both forgot and were SURPRISED when we got there. We picked up our credentials and then walked into the speedway because HELLO CARS WERE ON TRACK!!! Fans could watch the test free and even get into the NEON GARAGE FREE which I think was a SMART thing to do. Of course I didn’t have my “real” camera with me because I didn’t think about it- I am not use to being at the track on a Thursday. It was fun though watching the cars practice and zip in and out of the garage. There was even a driver Q&A in the Neon Garage with drivers Carl Edwards, Greg Biffle and Mark Martin (Casey Mears was also suppose to be there but he was MIA for some reason that was never explained). So Misty and I decided to stick around for that- it was fun watching all the fans gather around the stage for the Q&A and wait. 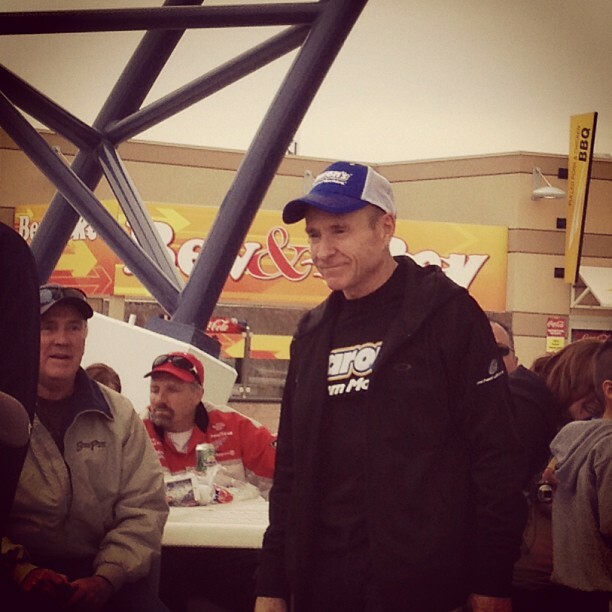 Mark Martin arrived early to the Q&A and spent a lot of time with fans out in the Neon Garage signing autographs and taking pictures. That was great to see that fan interaction and let me tell you the fans ate it up.